The Sculpture Center is seeking an Arts Intern to work directly with the Executive Director + Chief Curator to assist with the installation of the 2019 summer juried exhibition, After the Pedestal, the 12th exhibition of small sculpture from the region, and to prepare for two 2019 fall exhibitions of the work of African American artists of national and regional reputation. SeenUNseen will exhibit selected works from the Kerry & Betty C. Davis Collection of African American art (located in Atlanta, GA) with work by African American artists of northeast Ohio. This exhibition is being held in collaboration with the arts organization adjacent to The Sculpture Center, the Artists Archives of the Western Reserve (lead institution) A second exhibition in The Sculpture Center’s Euclid Avenue Gallery will highlight the work of an emerging, early career African American artist of our region. See PDF or our website for full details. This internship is offered through the Studio Institute (New York). Application begins at their website. When you have been approved as per the requirements listed below, you will get in touch directly with The Sculpture Center. Internships last 9 weeks (June 10 – August 9), and interns work 28 hours a week. Interns will be paid $15.00 per hour for a total of $3,780. 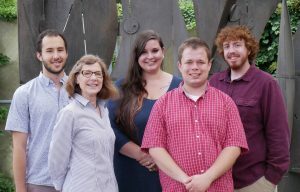 In addition to working at The Sculpture Center, Arts Interns must participate in the education component of the program, which is spread out across nine program days throughout the summer. These days will be used to visit other Cleveland institutions, where the Interns will have the opportunity to learn about other jobs in the field. These days will also be used to complete program assignments. Students are paid for this by the Studio Institute. Students must be enrolled full time as an undergraduate junior or senior in the Fall following the summer program. This means when you apply, you should be a rising junior or senior, or finishing senior year the following Fall. Students must meet the residency requirements: Attend college in Cleveland, or live within Cleveland or the boundary established by the Inner Ring Suburbs. Students must have an Expected Family Contribution, of less than $5000. This number is on your FAFSA form, to see what it looks like — click here.